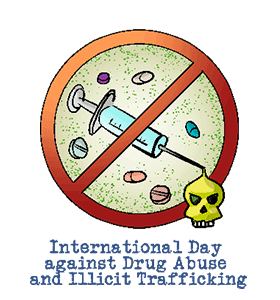 ﻿International Day against Drug Abuse and Illicit Trafficking: Calendar, History, Tweets, Facts, Quotes & Activities. The International Day Against Drug Abuse and Illicit Trafficking serves to draw awareness to the need for action and cooperation in order to achieve a drug-free world. Illicit drugs and their trafficking pose a large health threat to humanity. Drug problems and dependencies put a great deal of pressure on health care systems and constitute a threat to the safety and well-being of humans all around the globe. Long-term drug abuse has been linked to poor general health, contraction of diseases through needle sharing, trouble with the law, poor self-hygiene and alienation from loved ones, psychological illnesses and death from overdose. In December 1987, the International Day Against Drug Abuse and Illicit Trafficking was designated by the United Nations. It is celebrated annually on June 26, a symbolic day that commemorates the dismantling of the opium trade in Guangdong. The day also serves as an opportunity for Member Nations to reaffirm their support for UN Conventions that attempt to control the world's drug supply. Deaths caused by drug overdose rose faster than ever in 2016, and were likely to continue to worsen in 2017, as reported by the New York Times. Approximately 51 billion dollars is spent on the war on drugs in the US every year. 40% of all violent crimes occur under the influence of alcohol. No one is immune from addiction; it afflicts people of all ages, races, classes, and professions. – Patrick J. Kennedy, American democratic politician and former US representative for Rhode Island. Donate to one of the many addiction and substance abuse recovery charities and safe injection sites in your neighborhood. All proceeds are used to help treat addicts who are looking to recover from drug addiction and return to society and safe needle programs help reduce the spread of HIV/AIDS and other diseases. Watch a movie on the perils of the war on drugs on society, government and the citizens involved. Some suggestions are: Dallas Buyers Club (2013), Sicario (2015), Requiem for a Dream (2000), Christiane F (1981) and Blow (2001). Attend the World Drug Report 2016, which is organized by the United Nations Office on Drugs and Crime, by watching the webcast online. Spread awareness by using the hashtags #WorldDrugDay, #saynotodrugs and #warondrugs on social media. Read a book on the dangers of drug use and the problems with the war on drugs. Some suggestions are: Smoke and Mirrors , Chasing the Scream , and Drug Wars .